An artificial placenta being developed at C.S. Mott Children’s Hospital for the treatment of extreme prematurity may one day save thousands of lives. On the 8th floor of C.S. Mott Children’s Hospital, a three-pound infant sleeps on her belly in an incubator, right fist tucked against her mouth, her shoulders, back, and feet covered in pink baby blankets. The room is quiet, except for the gentle sound of water bubbling in a device that supports the baby’s underdeveloped lungs, delivering humidified air through plastic tubing. If all goes well, this mighty infant — who has doubled her weight since birth at 25 weeks gestation — eventually will not only breathe on her own, but run and play. In premature infants, the most critical organs are the lungs, says George Mychaliska, M.D., the Robert Bartlett Collegiate Professor of Pediatric Surgery, and associate professor of surgery and of obstetrics and gynecology. “If the lungs don’t exchange oxygen and carbon dioxide,” he says, “the infant can’t survive.” Thanks to numerous interventions targeting the lungs, infants born as young as 28 weeks have a greater than 95 percent chance of survival. But before 28 weeks, things get dicey. The huge improvements in survival and overall health of babies born prematurely have not reached the youngest preemies, who account for 50,000 births in the United States each year. Researchers describe a “gray zone” of 23–25 weeks, with survival rates of 30–75 percent, and infants are at increased risk for outcomes such as cerebral palsy, chronic lung disease, cognitive impairment, asthma, and hearing loss. This is why he has spent more than a decade designing and testing a radical new solution: an artificial placenta that recreates the intrauterine environment, allowing gas exchange without breathing and completely supporting a premature infant while she grows and develops. Mychaliska predicts the artificial placenta will be ready for clinical trials in five years. “This would completely change the paradigm of how we treat premature infants,” he says. Until they’re ready, the youngest babies wouldn’t need to breathe. Before going further, it’s important to point out what the artificial placenta is not designed for: “We have no intention of lowering the age of viability,” says Mychaliska. “This is not intended to be a brave new world where we take over reproduction,” he adds, referencing Aldous Huxley’s dystopia in which humans are mass-produced by an authoritarian state. Such scenarios simply are not feasible with the artificial placenta’s design. For instance, the cannulas — thin tubes that help circulate the infant’s blood — wouldn’t work well on infants earlier than 23 weeks, the earliest most hospitals will attempt resuscitation of a premature infant. Instead, Mychaliska and his team are trying to solve a clinical problem for those 23 weeks gestation and up: Treating them requires a huge investment of scarce resources; even so, many die while others survive with long-term disabilities. How can we improve their outcomes? One way to approach the problem is to account for the nature of fetal circulation. In utero, a fetus doesn’t use its lungs for oxygen and carbon dioxide exchange. Instead, it relies on the placenta: a crimson, disk-shaped organ, weighing approximately one pound. An out-of-body artificial placenta simulates the intrauterine environment and provides gas exchange without mechanical ventilation. During pregnancy, the placenta attaches to the uterine wall and connects with the fetus’s umbilical cord. The umbilical vein transports blood rich in oxygen and nutrients from the placenta to the fetus. Things get interesting when this blood reaches the heart. Rather than being shunted to the lungs, as it would be in a newborn or adult, the blood largely bypasses the developing lungs. Instead, most of it passes through a duct in the pulmonary artery and makes its way back to the umbilical arteries and the placenta, where it can receive more oxygen and nutrients from the mother. This is why micro preemies have so much trouble breathing. In utero, they would be relying on the placenta, not on their underdeveloped lungs, which are normally filled with fluid before birth. Mychaliska wondered: What if we could create a womb-like environment for these preemies? A system that allows their lungs to mature without subjecting them to harm caused by mechanical ventilation before they’re ready? Such questions have spurred research on an artificial placenta, which dates back at least to the mid-1960s. Successes over the decades have been incremental. Groups at different institutions started then stopped because they faced numerous challenges: lack of sophisticated technology, gaps in the understanding of extreme prematurity. Perhaps most importantly, developing an artificial placenta requires “tremendous infrastructure and a multidisciplinary team,” says Mychaliska. Fortunately, when he arrived at U-M in 2004, the infrastructure was already in place. The university’s Extracorporeal Life Support Laboratory has been designing lifesaving technologies for nearly four decades. It was founded, and is currently led, by world-renowned Professor Emeritus of Surgery Robert Bartlett (M.D. 1963). In the 1970s, Bartlett invented a new type of heart-lung machine, known as ECMO (short for extracorporeal membrane oxygenation), that could be used for days or weeks, instead of just a couple of hours in the operating room. The machine supports heart and lung function, sometimes both in the same infant. Mychaliska predicts the artificial placenta will be ready for clinical trials in five years. When Bartlett joined the faculty at U-M in 1980, he had used ECMO for about 40 patients, most of them newborn (but not premature) infants with lung failure. “Everybody thought it was crazy,” he says. “Neonatologists said, ‘are you kidding, taking this little baby and hooking him up to a great big machine and running the blood through it?’” In the 1970s and early 1980s, it was hard enough to support a baby’s heart and lungs through a two-hour heart surgery. Supporting the lungs for days at a time was viewed as pie-in-the-sky. But Dietrich Roloff, M.D. (Residency 1968, Fellowship 1970), a neonatologist at U-M, was willing to give it a try. The U-M team began employing ECMO, and, suddenly, babies who previously were very likely to die now faced a 60 to 80 percent chance of survival. Neonatologists across the country took note. They started coming to U-M for training, and ECMO spread to other children’s hospitals. By the late 1980s, ECMO was standard practice for newborns with lung failure. ECMO eventually was used in adult respiratory failure. Now there are more than 100,000 names in the patient registry. In 1980, just six or seven people worked in the Extracorporeal Life Support Laboratory at U-M. Now there are 150, nearly 100 of them undergraduates. At any given time, the laboratory is working on several separate but interrelated projects, which currently include creation of an artificial lung, plastic tubing that doesn’t cause blood clotting, and, of course, the artificial placenta. The lab uses sheep for its animal models because of the close similarities to human physiology. Bartlett predicts that in the next year or two, the artificial placenta team will be at the point when the device works consistently in lambs, to be followed in about five years with clinical trials. “The artificial placenta is a combination of components that are already in use,” explains surgical resident Joseph Church (M.D. 2012), who spent two years on the project as a research fellow. The most important component is a commercially available oxygenator, which functions as the placenta, receiving the deoxygenated blood that flows from the newborn’s jugular vein through a soft tube. Small fibers inside the oxygenator help remove carbon dioxide and add oxygen. The replenished blood then flows through another tube and is returned via the umbilical vein. Worldwide, only a handful of researchers are trying to develop an artificial placenta. A team at the Children’s Hospital of Philadelphia recently made news when its lambs survived four weeks inside a device that is referred to in the press as an “artificial womb” because it incorporates a clear plastic bag filled with synthetic amniotic fluid. “Their work is impressive,” says Church, noting that the Philadelphia team’s fluid-filled bag is more analogous to a true intrauterine environment than U-M’s dry system. The big advantage of U-M’s system, says Church, is that it allows doctors to “deliver a baby normally and pursue standard of care.” That way, an infant whose odds of survival are greater than 50 percent will not be subjected to the risks associated with an artificial placenta, most notably intracranial hemorrhage, or bleeding around the brain. But how do physicians determine which babies are likely to survive and which aren’t? Michigan’s team is working to answer this question because the success of the technology depends not just on building a new machine, but on knowing when and how to use it. Their numbers are still rudimentary, but the team estimates that in the U.S., 15,000 infants a year eventually might qualify. When the technology is first introduced, however, it will only be offered to a small population: those infants deemed to have the lowest chance of survival with conventional treatments. The researchers also want to ensure that infants on the artificial placenta continue to function and develop normally. “We have to think about all the things we’d be taking care of in a premature baby,” says neonatologist John Barks, M.D. (Fellowship 1987), who helped design the study. “How you manage blood pressure, intravenous nutrition, sedation, blood transfusions, carbon dioxide levels, salt levels, blood sugar levels — all of the really obsessively detailed management that we’ve learned to do over the years in neonatology.” The goal, he says, is to give the infant “a two- to four-week breather” on the artificial placenta, during which development occurs as it would in the womb. Then, the infant could be transferred to more conventional forms of support. McLeod herself is 39 weeks pregnant at the time of this interview. Doing this research, she says, she finds herself thinking, “What would I do as a mother delivering a baby with a new technology?” When her fetus was in the gray zone several months ago, she knew that, were she to deliver then, she would want that technology. As with all emerging technologies, the development of artificial placenta technology raises ethical considerations surrounding a host of issues: the cost of care, animal testing, the age of viability as it relates to abortion law, the decision to treat infants who face a greater-than-average likelihood of severe disability. Physicians and parents at U-M and beyond are contributing to ongoing discussions about how to implement this technology fairly and humanely. The researchers who are developing the artificial placenta at U-M hope that it will improve survival rates and decrease lifelong conditions such as cerebral palsy, blindness, and mental impairment among extremely premature babies. 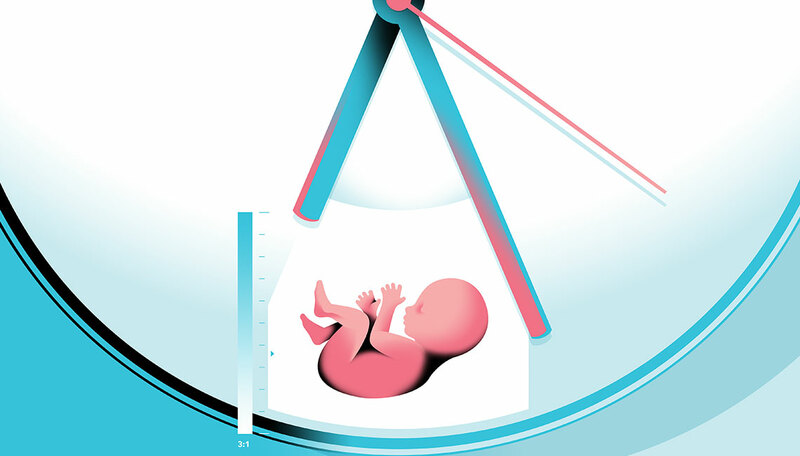 Mychaliska and Bartlett address one of the central ethical issues by stating that they do not want the technology to be used with babies born any earlier than the current age of viability, about 23 weeks (see main story). Bioethicists point out that many of the ethical concerns already are addressed in neonatal intensive care units here and around the country. “The earlier a baby is born, the more likely they are to not survive, or to survive with significant impairments. When outcomes are uncertain — as they are for infants born around 23 weeks gestation — the parents decide whether or not to resuscitate their premature infant,” says Naomi Laventhal, M.D., clinical assistant professor of pediatrics and communicable diseases. To help parents make this decision, U-M provides inpatient and outpatient consultation.